We've heard it so many times. "Why would you waste your money on a trip they'll never remember?" "You're better off taking them on a trip they'll appreciate and enjoy"
"What a hassle! You couldn't pay me travel with my kids! Maybe a camping trip, but crossing time zones? air ports? never." All fine opinions to hold, but not where we stand. Brad and I met at the Casablanca airport. We knew each other on foreign soil before becoming friends in Canada. Due largely to missionary work, we had both traveled to many countries and continents before getting married, and continued to do so afterwards. When we had kids, we had no desire to change the pattern. There are lots of reasons why people avoid travel (specifically international travel) when they have little ones and many of them are legitimate. Financial reasons aside, there's the time zone change, long flights, interrupting potty training/sleep training/feeding issues, fear of being in a foreign place should an emergency occur (fears always heightened with kids), etc. But those are probably what already come to mind when you think about traveling with littles, so let me give you some positives to consider. 1. Starting young is always beneficial. Travel requires a lot of flexibility from children. If you ever hope to travel with your kids before age 18, why not get them started young? Now our kids know how fun a trip will be so they can more easily look past the challenges (especially the boring, confining, long flights). Our kids are very scheduled and structured at home, but they've learned to be extremely flexible on long car rides and flights because it's become somewhat common. We saw Lily on the tiny ultrasound monitor when I was 28 weeks along with her, in an African clinic with a doctor who only spoke Arabic and French. We've been at it since the beginning and have no regrets! Even though my husband has figured out a way for us to fly overseas nearly every year as a family for free (see his blog), there are additional costs aside from the flight. But for anyone considering an international flight with kids, you can't look past the best news ever - KIDS FLY FREE UNDER AGE 2. Hello! This is huge. We flew to Vancouver (work related) with our kids when Oli was 8 weeks old and Lily was 16 months old and we also went to France (for Brad's paternity leave) when Oli was 8 months old and Lily was almost two. Chloe was also free on our family trip to Copenhagen and Amsterdam last summer. In every instance, we didn't pay more than a small surcharge for the kids. Don't miss that opportunity! This summer we are planning a trip as well, to take advantage of Chloe's last few months as a free flyer. Many airlines try to entice families to fly by offering discounts on kids over age two as well. Look into it! On top of the free or reduced flights, we have found kids to be very affordable abroad. When we went to France with two under two, we ate out often but the kids just filled up on the bread bowl and some fruit we brought along. Mom and dad could enjoy the best of French cuisine and not spend a euro on the kiddos (I did write about tips for fine dining with kids after that trip, if you're interested!). Little ones also allow for smaller accommodations. Many Airbnb locations offer cribs and you can fit young children in one room much more easily than you can teenagers. On our trip to Vancouver our then-family-of-four shared a small bedroom all together. It was cozy, but worth it to be able to travel together! Lastly, most touristy things (think museums, castles, zoos) are free for young children and reduced rates for older children. It's not always easy finding childcare for your children for extended periods of time. While many people assume this means they'll be home bound for the next 5-10 years, we just couldn't imagine it. Wanderlust is just too strong. And while I strongly believe in parents having time away from their children (will blog on this soon! ), bringing them along is a good solution. It's true, the kids likely won't remember their travels in the long term. But we will. Traveling with our children has provided precious memories for us, and we are remembering for them. Our kids love looking through family photo books we've made from each of our trips. At age 4, Lily remembers a great deal from last year's trip - sometimes the most random things, like how we called the National Gallery of Denmark "The Museum Of 1,000 Strollers". 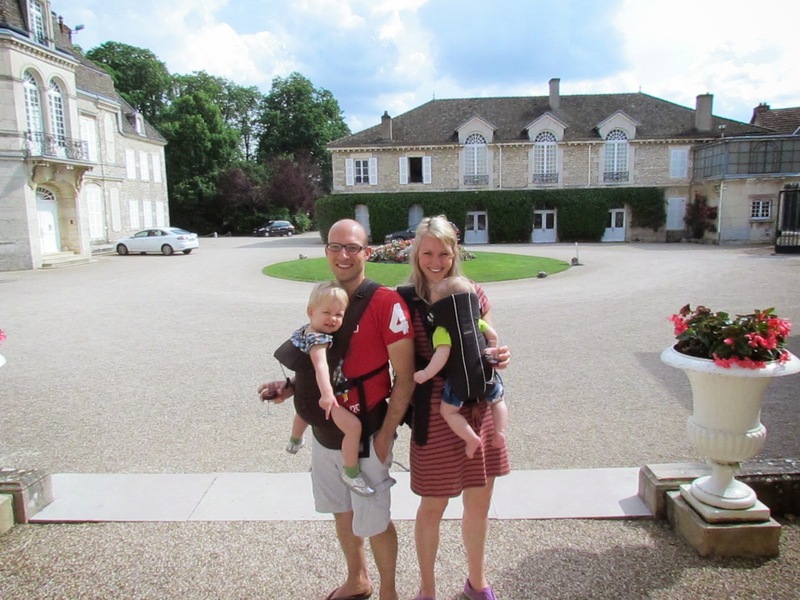 Wine tasting in France with a baby on each of our chests is one of Brad and I's fondest memories from these crazy years raising little ones, and we wouldn't trade it.